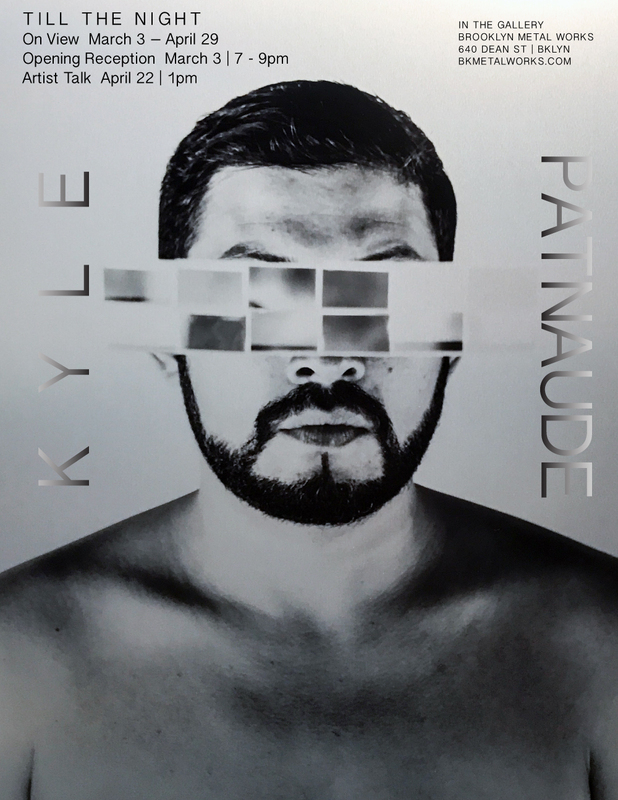 Kyle Patnaude’s work explores the emotive and humanistic coding of objects, specifically a certain “queerness” pertaining to the cultural guise of hypermasculinity. In Till The Night Patnaude works with queer narratives, from inherently counter-culture gay tropes to the Homoromanticism of masculine power within authoritarian regimes. Using historical figures as touch points Patnaude constructs representational characters to develop this dialog throughout the exhibition. The objects portrayed within Patnaude’s work often examine public elements such as city streets, restrooms, and parks, providing a subtext of “queerness” and double meaning. Till The Night includes three turned aluminum truncheons, the weapon of police and symbol of authority, as tokens of masculine prowess. These pieces are wearable as necklaces as is the rubber ‘sautoir’ made from a recurrent symbol in Patnaude’s work, a manhole cover pattern. The latter is shown as a garland on Jacksie, a queer skinhead, the Alt-Right caricature of gay fascism in Patnaude’s narrative. Kyle Patnaude is currently based in Portland, Maine as a Visiting Assistant Professor at Maine College of Art. He completed his BFA degree in Sculpture from Pratt Institute in 2006 and in 2012 received an MFA in Metalsmithing from the University of Wisconsin Madison. Embracing a hybrid practice as a sculptor rooted in the rich traditional methods of metalsmithing, the work unites contemporary sculptural forms with the skill and elegance of precious metalworking. Till The Night by Kyle Patnaude will be on view In the Gallery at Brooklyn Metal Works from March 3 – April 29, 2018. The opening reception will be from 7-9pm on March 3. An artist talk will be held on April 22 at 1pm . All events are open to the public. Please join us.